Note: This post is unusually long but dinner here was so good that it deserves the extra words. As I have stated in previous posts (here and here) Fishbones in Delafield, Wisconsin is one of the best restaurants in the Milwaukee metropolitan area. It would easily make my top 10 list. After eating at Fishbones several times, we finally found a weekend when we could try out Zin, the newest restaurant venture by the team of restaurateur Dennis Sobczak and chef Jesse Sousa. There were four of us, so I was excited at the prospect of trying four different entrees and a couple of appetizers. When we arrived a happy customer was smoking out on the sidewalk in front of the restaurant (smoking is thankfully not allowed in the bar or restaurant, a decision that the owners recently made). The guy says hi and demands that we try the Osso Bucco, claiming that it was amazing. We walk in and were told it would only be a short wait for a table. The bar is very cool looking with an old fieldstone wall. The entire restaurant is stunning with lots of touches that make you feel like you are on the East Side or even New York. It definitely doesn't feel like Delafield. The tap selection is ok but could be improved upon. I ordered Sierra Nevada pale ale, though I think a local microbrew like a Tyranena Headless Woman IPA or a Lakefront Cream City Pale Ale would have been a better choice, but what do I know about stocking a bar. The beer was cold and fresh and that is good enough for me. My dining companions had wine or mixed drinks, which they all seemed pleased with. After a short 15 minute wait (not bad for a Saturday at 7pm) we were seated upstairs. It was very hot, almost uncomfortably so. However within a few minutes it quickly cooled down to a comfortable level. Someone else must have said something. As we perused the menu my eyes wandered around the room at other diners and what was on their plates. My wife saw some incredible looking seafood dish with lobsters and shrimp and asked the stranger what it was. She informed her it was the baby lobster and shrimp with mushroom risotto. She added that it was delicious. While we were trying to decide on our entrees, we opted for two appetizers. The fried calamari and the crab stuffed shrimp were the two that we could all agree on. We also ordered a large Caesar Salad. The waitress brought back a large platter of calamari rings and a marinara sauce. The calamari had been battered in a Seirra Nevada pale ale. A dash of salt was all that was needed to make the calamari’s taste come to life. They were excellent and really didn't need any sauce as they were great by themselves. The crab stuffed shrimp were medium sized and there was a fair amount of crab inside. They were cooled perfectly and the crab was extremely sweet. We devoured both appetizers. The Caesar Salad was pretty good, nothing out of the ordinary. One touch that I apperceived was the anchovy filets spread across the top of the salad. Nobody at the table wanted them so I took them all. With the anchovy, the salad was above average. I think I would have preferred the one of the other salads, which include an Avocado Chop, Goat Cheese, or Roasted Pistachio and Apple. We all opted for different main courses. I wanted the Halibut and Saffron Risotto, which Dennis Getto called some of the best he has ever had, but the waitress convinced me to try the special of the night, which was a filet of Corvina, a white sea bass from California that I had never heard of. The fish was covered with a shrimp and tomato concasse and set atop a mound of the best tasting cannellini beans I have ever head There was a distinct flavor of pork in them, so I assume they were cooked with a pork hock or some other flavorful chunk of pig. The fish was perfectly cooked with a delicate mild flavor, which kind of reminded me of snapper. The shrimp and tomato concasse added just the right touch to the fish. The waitress indicated that they may be adding this to their regular menu as it is always a hit as a special. My wife had the tortelloni stuffed with lump crab, roasted garlic and Ricotta and Asiago cheese with a Gorgonzola cream sauce. The oversized tortelloni were packed full of tender succulent crab, not the small cheap stringy bits you find in many stuffed pastas. The Gorgonzola sauce was restrained enough not to overpower the delicate crabmeat. My sister-in-law opted for the baby lobster and shrimp with a herbed mushroom risotto. The seafood was cooked perfectly and the baby lobster, about the size of a large shrimp, was delicious. The shitake mushrooms added an earthy element to the creamy herbed risotto. Taking a cue from the satisfied patron outside, my father-in-law ordered the Osso Bucco Milanese. The huge portion arrived with Fontina country mashed potatoes and braised vegetables. They even supplied a small spoon so diners can scoop out the delicious marrow from the bone. The meat was fork tender and the diced vegetables were soft without being mushy. In his review, Dennis Getto, who in one paragraph praises the mashed potatoes by stating "The taste of the cheese and potatoes delivered a welcome detour from the garlic-mashed potatoes served at so many other places," goes on to say about the exact same potatoes that he wasn't as excited about them when paired with the Osso Bucco. He wanted risotto, which is traditionally served with Osso Bucco. I think that Zin should be commended here. There were so many veggies in the sauce that they would have mixed with the risotto and the taste of the saffron would have been lost. But Getto, true to form, had to impart his know-it-all commentary into the review. Diners don't be swayed; the potatoes were a perfect match to this rendition of Osso Bucco. We managed to save enough room for dessert, a chocolate fudge cake, which was dense and delicious. The wine selection was unpretentious and offers a wide array of wines, which are listed by their flavor profile, which helps diners select the most appropriate wine for their dinner. Given the name of the restaurant, and impressive list of five Zinfandels (most places around here have one token Zin on the list), it was hard for me to pass up a glass of my favorite type of wine but I figured the bold spicy taste would interfere with my delicate fish entree. I opted for a lighter Echelon Pinot Noir, which was flavorful but mild enough to go very well with the Corvina and shrimp and tomato concasse. 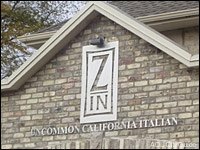 All I have to say is that Zin really is as the owners describe it "Zincredible." Classy enough for a romantic night out but casual enough to grab a bunch of friends for a fun evening of dinner and drinks, Zin is sure to be pleasing the palates of Waukesha County residents for years to come.